GOURMANDS would agree that culinary is an art that refers to both the process of whipping up scrumptious treats to please the taste buds and garnishing the creations to tantalise the visual senses. At newly opened Ovo – Latin for “egg” – great efforts were put in by the chefs to ensure that the food taste and look good. The Rack of Lamb, for instance, was accompanied by lines of sweetened and reduced balsamic vinegar, and red, yellow and green dots that turned out to be the juice of bell peppers. Topped with deep-fried leek, the lamb racks sat nicely on cubed carrot, zucchini and potato wrapped with thin carrot slices. As with its appetising appearance, the lamb ribs, which was marinated then charbroiled to perfection, was satisfying. Armed with 18 years of culinary experience in a renowned hotel, executive chef Anuar Sani knew how best to please the diners. His Salmon Steak was seared then drizzled with creamy pesto sauce, and his Prawn Pesto Pasta would not disappoint pasta lovers. “I sauté the garlic, then add in freshly made pesto sauce and chili, then pasta and prawns,” he said. The semi-fine dining restaurant does not offer just Western cuisine. 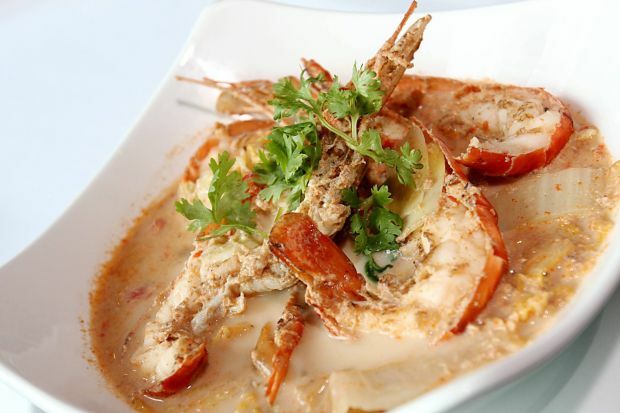 Also found on the menu are Japanese, Italian, Oriental and local delights. Chef Daniel Yong was eager to feed us the dainty creations from his sushi bar and we gladly obliged. The Avocado Sushi featured spicy tuna wrapped in soft and creamy avocado slices. One would have thought that the chives was only for decoration but Yong urged us to chew it to cleanse our palate before we moved on to the next item. We simply adored the Nippon Harumaki, which was a refreshing salad fashioned into a sushi. 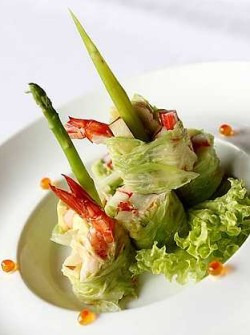 “I wrapped diced Fuji apples, prawns, fish roe, crab stick and avocado in steamed Chinese cabbage leaves,” Chef Yong said. He also strongly recommended the live oysters, which were air-flown from the United States. From the Oriental side, we relished Claypot Glass Noodles and Prawns cooked with Chinese Wine and Ovo Fried Rice with salted egg yolk and diced prawns. Food aside, the décor in Ovo is pleasing to the eyes too. Bamboo trees lined the space behind the long bar, adding an Oriental feel to the neat and chic setting of the restaurant. With private function rooms and a wine and cigar room to boot, the semi-fine dining atmosphere of Ovo in the day will make way for a bistro when live bands and DJs take over the stage at night.